In July of last year, Alabama was pouring money into an industrial park, Hyundai was setting sales records and lawmakers were celebrating the expansion of a Shorter auto supplier. Headlines talked about the manufacturing boom and about the struggle to rebuild the job market. 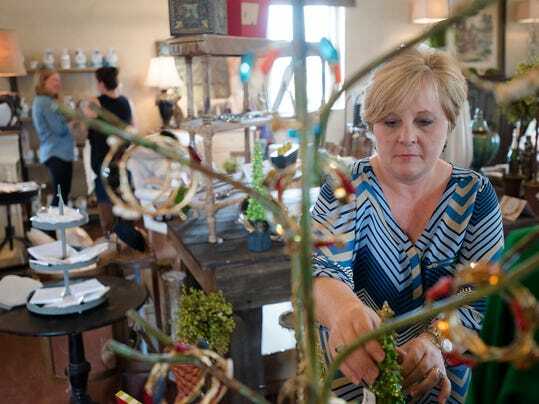 That same month, Adrian Bell and Rebecca Hall quietly opened their mother-daughter business Quite the Pair in east Montgomery, just one of the dozens of tiny businesses that popped up across the River Region in July. Whether they’re in the headlines or not, people such as Bell and Hall could hold the future of the state in their hands. Microbusinesses, which have five or fewer employees, make up 88 percent of all state businesses according the Alabama MicroEnterprise Network. There are 165,000 of them in Alabama alone. Business has been good at Bell and Hall’s home décor and gift shop, but they haven’t been able to grow. How much could it help if they did? A study by the Association for Enterprise Opportunity found that if one out of every three of the nation’s microbusinesses added just a single worker, there would be no more unemployment. They may be small, but their cumulative impact is massive. That was the message earlier this week at a summit that focused on building a support network for them. “If you’re an attorney and you have a paralegal and a receptionist, that’s a microbusiness,” said Gaynell Jackson, president of the Alabama MicroEnterprise Network. “If there’s a grocery store that has two clerks, that’s a microbusiness. You see them every day. With freelancers and entrepreneurship on the rise, microbusiness numbers have swelled. Experts predict it will keep rising. The Freelancers Union estimates that about one-third of all workers, 52.9 million, are freelancers right now — although about 14.3 million of these workers have a primary, traditional job and only use the freelancing to supplement their income. Still, there are estimates that in the next five years, about half of all workers will freelance. About 20 percent of millennials own their own businesses and that generation will make up 75 percent of the workforce by 2020, according to Gen Y research group Millennial Branding. “I think it’s a key piece of where the economy’s going and where the labor market’s going,” said Joyce Klein, the director of an Aspen Institute group that tries to build a better support network for microbusinesses. Klein said more of that kind of support is needed from lawmakers and community leaders in Alabama. “If you’re an economic development arm of the city, you might say, ‘We’re going after this business because they have 25 employees and they bring in a half-million dollars in revenue. '” Jackson said. “Well, you could go after five businesses that have five employees and have $100,000 in revenue. And now you’ve given five businesses the ability make money and help their community as opposed to just one. AEO Board Chair Patricia Harris was one of the speakers Tuesday at the microbusiness summit in downtown Montgomery. “You have such a wonderful engine already here in Alabama,” Harris said. “All it needs is to be continuously fed.